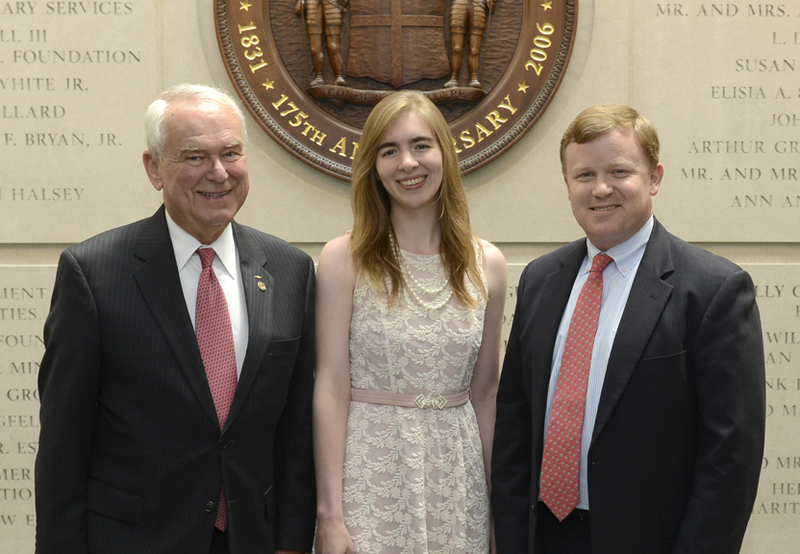 Paul Galanti, Adrianna ScheerCook, and Paul Levengood at the VHS’s 2014 awards luncheon on July 16, 2014. It is our pleasure to host Adrianna ScheerCook as guest author of this post. SheerCook was recognized at the Virginia Historical Society’s 2014 awards luncheon on July 16. She was the winner of Virginia Commonwealth University’s 2014 Undergraduate History Paper of the Year Award for her paper entitled “Phyllis Galanti and the Importance of Private Citizens’ Activism during the Vietnam War”. Along with personal interviews with Phyllis Galanti, SheerCook used the Galanti papers in the VHS collection for her research. 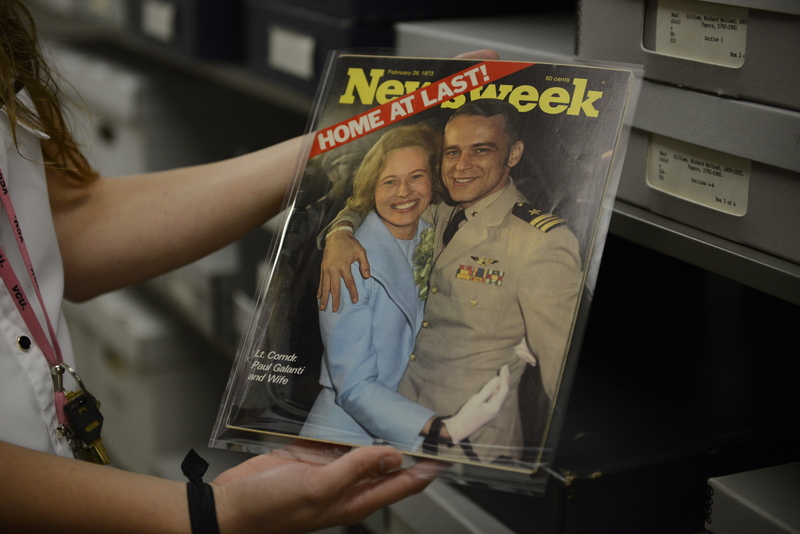 On June 17, 1966, Lieutenant Commander Paul Galanti of the U.S. Navy was shot down over North Vietnam, beginning almost seven years of captivity for him and a lifetime of public service for his wife Phyllis. During Paul’s time at the infamous “Hanoi Hilton” prison camp, Phyllis transformed from a shy navy wife into a whirlwind political force who brought governmental, national, and international attention to the plight of POWs in Southeast Asia. 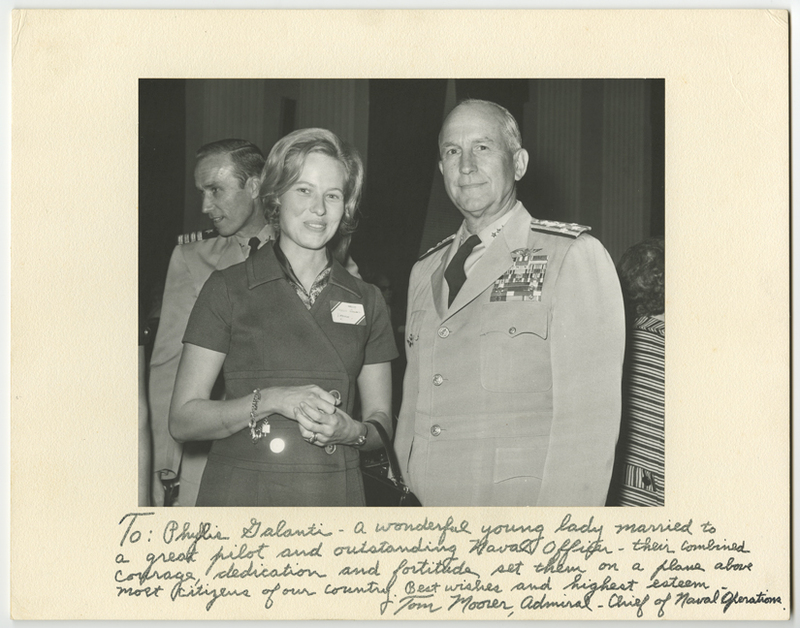 Her comprehensive collection of documents housed in the Virginia Historical Society’s archives reveals her belief that the cooperative actions of private citizens was capable of influencing the outcome of international affairs, particularly the treatment and return of the POWs during the Vietnam War. Phyllis’ mobilization efforts on behalf of the POWs started locally with her leadership of the Richmond “Write Hanoi” campaign in February 1971. Through this campaign, individuals were asked to write letters to the North Vietnamese government expressing their wishes for the government to treat the POWs humanely in accordance with the 1949 Geneva Convention standards. These guidelines included releasing a list of all POWs, allowing the prisoners to send and receive letters, and providing them with access to adequate medical care. Phyllis roused massive participation in this movement, motivating groups from elementary schools, colleges, labor unions, churches, and businesses to volunteer by manning sites for the letters to be collected and written and by organizing letter drives in their respective spheres. Fourth grade teacher Joyce Goforth from Bowling Green Elementary School was just one of the teachers to send Phyllis letters from her students, while Reynolds Metals Company enclosed a brochure about Paul in employees’ salary envelopes. The United Virginia Bank also included pamphlets about the POWs in their checking account mailings, resulting in 235,000 of these leaflets reaching Richmonders. All these efforts resulted in the collection of 452,000 letters from Richmonders to the North Vietnamese government. Soon, Phyllis’s work on behalf of the POWs moved to the international stage. In 1971, she organized a delegation to travel to Stockholm, Sweden, to deliver the letters from the Richmond “Write Hanoi” campaign. Many major news outlets, such as the Associated Press, covered the visit, and she met with the Swedish Red Cross and the Swedish Ministry of Foreign Affairs. However, Phyllis’s ultimate goal was to get an audience with the North Vietnamese ambassador to Sweden to directly deliver the letters and voice her concerns about the treatment of POWs. This was unprecedented, and no one, including the press and the local U.S. embassy, believed she would be able to accomplish it. Undeterred by the extremely remote chance of obtaining such a meeting, Phyllis went directly to the North Vietnamese embassy and asked for an audience. When the officials denied her request, she warned them that she would come back with members of the media to publicly deliver the letters to the embassy. The North Vietnamese delegation did not want such publicity, and consequently, because of her persistence, she secured an hour and twenty minute long meeting with Mr. Viet, the charge d’affaires. Her trip was a great success because she, as a private individual, had a chance to convey the sentiments of the American people both to the diplomatic representatives of North Vietnam and to an international audience. Ever humble, Phyllis insisted that she and the other military wives were simply “making it up as they went along.” In fact, they were moving out of their supportive background roles to take an active stand against the inhumane treatment of POWs in Vietnam, and they succeeded. Happily, Paul returned home to Phyllis in February 1973. They resumed their life together, and both remained active in the Richmond community, serving as educators about veteran affairs. Appropriately, the Virginia War Memorial dedicated its new education wing to Paul and Phyllis in 2010 to honor their work restoring the monument as well as their decades acting on behalf of prisoners of war and veterans. Throughout her amazing life, Phyllis truly demonstrated the impact a determined, caring, and brave individual could have on the lives of so many. Periodically the Virginia Historical Society will post content created by guest writers. The opinions expressed are theirs alone and do not necessarily reflect the opinions of the Virginia Historical Society, its members, or its staff. The Virginia Historical Society encourages discussion; however, we reserve the right to remove comments that are offensive, threatening, or insulting.